The Gotex (ゴーテックス) is a Japanese 6×6 folder made by Kigawa from 1941 to the end of the war, and later by Shin Nippon Kōgyō. The Green and Grace Six are variants of the Gotex, and the Poppy Six is a further evolution. The line was later continued by the Minon Six. The Gotex is a horizontal folder, with three-part folding struts similar to those of the Ikonta. The top housing contains both an eye-level finder in the middle and a brilliant finder offset to the right, as seen by the photographer. The body release is to the right of the brilliant finder, and the accessory shoe and folding bed release are to the left of the eye-level finder. There are strap lugs at both extremities of the top plate, and the film is advanced by a key at the left end. The back is hinged to the right and the back latch consists of a long sliding bar. There is a single red window in the middle of the back, protected by a horizontally sliding cover. The wartime Gotex have a large KSK logo engraved above the eye-level finder, presumably for Kigawa Seimitsu Kōgaku. The words TOKYO JAPAN and KIGAWA KŌGAKU are inscribed underneath. The large KSK logo is repeated in the leather of the folding bed and at the front of the leather case. The folding struts and red window cover also have a logo, certainly reading KIKO TSUBASA. The name GŌTEX is embossed in the original leather covering at the front of the camera. The red window is surrounded by the name KIKO SIX embossed in the back leather on at least some cameras. Finally, the wartime Gotex have a small step under the accessory shoe, which was removed on later cameras. The Gotex is mentioned in the official list of set prices compiled in October 1940 and published in January 1941, for ¥160. The same document also has the "Tsubasa Six I" (¥79), "Tsubasa Six" (¥89), "Tsubasa Six II" (¥94) and "Tsubasa Six IV" (¥110). These were obviously made by Kigawa, but it is not known if they were related to the Gotex. A similar price list dated November 1941 again has the Gotex, attributed to its distributor Nichiei Shōkai. The Gotex was advertised in Japanese magazines from late 1941 to late 1944. 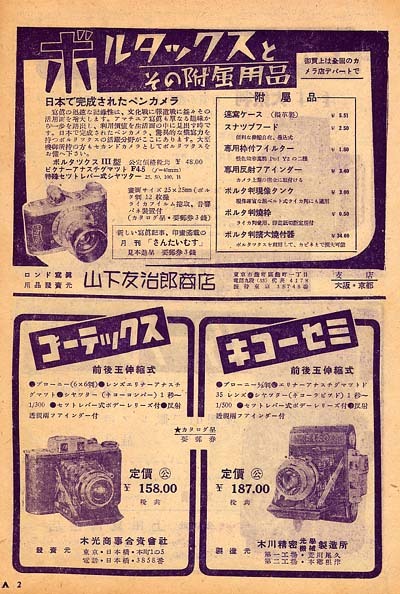 The November 1941 advertisement in Shashin Bunka says that the lens is an Erinar Anastigmat 75/3.5 and that the shutter gives T, B, 1–300 speeds. The price is given as ¥160. The main picture shows a plain round lens standard and unit focusing, and another picture shows lens no.60963. In the January 1942 advertisement in Shashin Bunka, all the features are the same and the shutter is called Kiko Compur (キコー・コンパー). The price has risen to ¥187. The picture is different, but still shows the round lens standard and unit focusing. The October 1942 advertisement in the same magazine shows a square lens standard with rounded corners and chrome plating, perhaps adopted to protect the focusing lever. The price and features are unchanged. The April 1943 government inquiry on Japanese camera production lists the Gotex with an Erinar 75/3.5 three-element lens and a Kiko Rapid shutter (1–500), both made by Kigawa. An advertisement dated February 1944 shows the same pictured as in that dated June 1941. It is unclear whether the shutter is a Kiko Compur (1–300) or a Kiko Rapid (1–500), and it seems that the price is ¥214.42. The early cameras have the lens marking KIKō Anastigmat Erinar 1:3.5 f=7.5cm N°xxxxx and a lens number in the 62xxx or 63xxx range. Further cameras, with a higher lens number in the 7xxxx range, have a different engraving: KIKO Anastigmat Erinar 1:3.5 f=75mm N°xxxxx. At least one very early example has front-cell focusing and a plain round lens standard. This particular camera has number 2601 engraved at the top, under the company name — this is surely not a serial number, but corresponds to year 2601 in the Japanese mythological calendar sometimes used in military ruled Japan, i.e. 1941. All the other wartime Gotex observed so far have helical unit focusing, moving the lens and shutter assembly together. They normally have a Rapid-Kiko shutter, giving T, B, 1–500 speeds and engraved RAPID–KIKO at the bottom of the speed setting rim. Most have a square lens standard with chrome plating, but at least one camera combines unit focusing with a round lens standard. At least some unit-focusing cameras have a four-digit body number inscribed at the top, as N°xxxx instead of 2601. Green camera works, Model "GREEN"
The Green is a name variant of the Gotex with front-cell focusing. It is mainly known from an example pictured in this page at Tomei Collection. The main body and top housing are exactly similar to those of the Gotex, except that there is no small step under the accessory shoe. The name GReen is engraved above the viewfinder, together with the words GREEN CAMERA WORKS, a dummy name which was perhaps used by some distributor (see Camera Works). The red window cover has a KKS logo, exactly similar to that found on the Mulix distributed by Kuwata, which used the "KKS" initials for various products. This might indicate that the Green was made by Kigawa for Kuwata. The lens is a Green Anastigmat 75mm f/3.5, and the focusing ring is strongly reminiscent of that of the Mulixar lens mounted on the Mulix, another hint that the camera was distributed by Kuwata, which was perhaps supplying some components. 1. Pisco (250–1, B, T), marked PISCO at the bottom of the black front plate and mounted on a plain round front standard. It is superficially similar to the "K.Prontor.S" shutter (200–1, B, T) found on some examples of the Mulix. 2. A different example found has a UNKNOWN shutter possibly a Rapid KIKO T,B, !~500, owned by Eastwestphoto. There is NO MIOJ markings and the shutter housing is High chrome, NOT black painted. The lens is # 3559 and is NOT coated. This seems to indicate a manufacture previous to 1947 or it would be marked MIOJ. 3. A third known example is equipped with a Rapid Presto Shutter (500-1, B, T) made by Kinshō. The lens is # 3516. The KKS logo is found on both the red window and the struts alongside the bellows. The Kigawa company was recreated in April 1946 under the name Shin Nippon Kōgyō. The Gotex appears in an advertisement by that company dated April 1948. The features are the same as in the wartime advertisements: Erinar Anastigmat lens and Kiko Compur (キコーコンパー) shutter. On the postwar model, the markings on the top housing were replaced by a large SNK logo and the words TOKYO JAPAN and SHIN NIPPON written underneath. The lens marking became Erinar Anastigmat 1:3.5 f=75mm, eliminating the word "Kiko", and the GŌTEX embossing disappeared from the front leather around the same time. It however seems that the logo on the folding struts and red window cover remained KIKO TSUBASA for some time. Nothing on the camera itself identifies it as a Gotex, but the commercial name was unchanged, as is demonstrated by the April 1948 advertisement. Today, some sources refer to the camera as the "SNK". Various examples of the postwar Gotex are known with a six-digit lens number in the 101xxx or 102xxx range and an unmarked shutter, giving either T, B, 5–200 or T, B, 1–300 speeds. All these cameras reportedly have KIKO TSUBASA logos. Unit focusing was gradually abandoned, and most of the Gotex made by Shin Nippon Kōgyō have a front-cell focusing lens and a round lens standard, though a few examples retain the helical focusing lever and square lens standard, either black painted or chrome plated. One later example, pictured below, is known with SNK TOKYO logos on the folding struts and red window cover. It has an NKS shutter (B, 1–200) with no flash synchronization, engraved NKS at the bottom of the speed rim, and an Erinar Anastigmat lens with four-digit no.1066. The aperture is set by a dented part, the same as on the Poppy Six but without the control wheel. This example is presumably a very late Gotex, made just before the switch to the Poppy Six. A further camera has a higher four-digit lens number (no.1203), an unidentified shutter (T, B, 1–300), SNK TOKYO logos, and the older diaphragm index shaped as a claw. Postwar Gotex, Erinar Anastigmat 75mm f/3.5 lens no.1066, NKS shutter, SNK TOKYO logos. The Grace Six is certainly a name variant of the Gotex (the name "Grace" was also used by Kigawa on the Graceflex). The camera is reported by McKeown as a 6×6cm folder, wrongly attributed to Daitoh. The description fits the Gotex, with dual eye level and waist level finders, a chrome top plate and a unit focusing Erinar Anastigmat 75/3.5. An unusual variant of the Grace Six, with a large helical tube instead of bellows, is pictured in an article by Furukawa. It is based on the postwar Gotex, and has the same SNK, TOKYO JAPAN and SHIN NIPPON markings at the top. The name GRACE–SIX is embossed in the leather covering on the back, above the red window. The red window cover has no logo, and there is no other marking. The tube has a double helicoid used for focusing, and a standing leg hinged on the side. It is reminiscent of that of the Ihagee Parvola. There is no body release, certainly because the addition of a linkage would have been impractical. The button used to release the folding bed on the regular Gotex is absent too. Finally, the advance key has no hole inside. The camera has an Erinar Anastigmat 75mm f/3.5 (no.100518), and an unnamed shutter giving T, B, 1–300 speeds. Furukawa says that the finish of the helical tube is similar to that of the top plate and was certainly made by the factory itself. Moreover, the two buttons at the top were removed smoothly, and the top plate was modified accordingly. It is very likely that the camera was modified by Shin Nippon Kōgyō, perhaps as an experimental model. Some recent sources mention a Poppy Six or Poppy Six I, but the pictured cameras are indistinguishable from the postwar Gotex with front-cell focusing and six-digit Erinar Anastigmat. These cameras have no marking identifying them as a "Poppy", and it is likely that they are misidentified. The Poppy Six II has a new heavier top housing, with an advance knob instead of a key. The window of the brilliant finder is round instead of square. The film flange at the top right has a serial number engraved at the top. The lens standard is chrome-plated and has a square top with rounded corners. It normally has a small wheel attached to the top left corner (as seen from the front), engaging the dented aperture ring. The name POPPY is engraved in block letters above the eye-level finder, the SNK TOKYO logo is engraved on the folding struts, and perhaps also on the red window cover. The name POPPY SIX is embossed in the back leather, around the red window. The name POPPY is repeated on the leather of the folding bed. It is also embossed at the front and rear of the leather case. Poppy Six II, Erinar Anastigmat 75mm f/3.5 lens no.1613, NKS shutter, SNK TOKYO logos. Presumably early cameras have an accessory shoe made of sheet metal, the same as on the Gotex, and have a POPPY II logo attached to the front leather, with a red or green background, reminiscent of the logo found on the Poppy subminiature. Some examples have an Erinar Anastigmat 75mm f/3.5 lens with a four-digit number. That pictured above has an NKS shutter (B, 1–200). A similar camera is pictured in Sugiyama, with a self-timer and two synch pins added to the NKS shutter. A further camera has been observed with a different shutter, certainly a Lustre, and with no aperture-setting wheel. The camera pictured below has a Daguerre 75mm f/3.5 lens (no.16268), the same as on the Kigawa Rectaflex TLR and on the Rosen folder. It has a synchronized NKS with a self-timer, and it is missing the aperture wheel, which seems to have fallen off. Poppy Six II, Daguerre 75mm f/3.5 lens no.16268, NKS shutter. A later example of the Poppy Six II is known with a heavier diecast accessory shoe and an Eria Anastigmat 75mm f/3.5 lens, with four-digit number 2696 and the name Eria engraved in red. It lacks the front logo, either because it has fallen off or because it was no longer used. The shutter is the same synchronized NKS, with two pins at the bottom and a self-timer. The Gotex and Poppy Six line was continued as the Minon Six. The original Minon Six, or Minon Six I, is indistinguishable from the late Poppy Six II with Eria Anastigmat lens, but for the engraving on the top housing. McKeown has various other entries which might correspond to name variants of the Gotex. The "SNK folding rollfilm camera" certainly corresponds to the postwar Gotex. The "Kiko 6", attributed to no particular company, is described as having helical focusing and a Rapid Kiko shutter (1–500), but its format is not mentioned. The "Tsubasa 6×6", attributed to Kigawa, has a Kiko Erinar 75mm f/3.5 lens and dual finders under a polished-chrome top housing. These models might be misidentified Gotex with the KIKO TSUBASA logos and KIKO SIX embossings, or might be related to the Tsubasa Six listed in the January 1941 price list. ↑ "Kokusan shashinki no kōtei kakaku" (国産写真機の公定価格, Set prices of the Japanese cameras), listing Japanese camera production as of October 25, 1940 and setting the retail prices from December 10, 1940. Published in Asahi Camera January 1941 and reproduced in Shōwa 10—40nen kōkoku ni miru kokusan kamera no rekishi (昭和10〜40年広告にみる国産カメラの歴史, Japanese camera history as seen in advertisements, 1935—1965). Tokyo: Asahi Shinbunsha, 1994. ISBN 4-02-330312-7. Pp.108—9., type 3, section 7B. ↑ "Kokusan shashinki no kōtei kakaku", type 4, sections 3, 4, 5A, 6A. ↑ Kokusan kamera no rekishi, p.336, lists advertisements from November 1941 to December 1944. The advertisement reportedly dated June 1941 in Onodera, p.18 of Camera Collectors' News no.127, is probably dated November 1941 instead. ↑ Advertisement dated November 1941 reproduced in Nakamura, p.29 of Camera Collectors' News no.173 (the same advertisement is dated June 1941 in Onodera, p.18 of Camera Collectors' News no.127, perhaps by mistake). ↑ Advertisement reproduced in Kokusan kamera no rekishi, p.68. ↑ Advertisement reproduced in Kokusan kamera no rekishi, p.71. ↑ "Kokusan shashinki no genjōchōsa" ("Inquiry into Japanese cameras"), item 95, lens item Lb16, shutter item 18-R-3. ↑ The columns listing the features of the Kiko Semi and Gotex are probably mismatched, as is indicated by the given format, and the Kiko Rapid (1–500) shutter perhaps applies to the Kiko Semi. The prices are probably at the right place, and the Gotex is presumably more expensive than the Kiko Semi. ↑ Examples observed in online auctions, and offered for sale by an online dealer. ↑ The camera is also mentioned in McKeown, p.371, in a text-only entry. ↑ Furukawa, p.2 of Camera Collectors' News no.156. ↑ The shutter speeds are given as 1–130, obviously a misprint for 1–300. ↑ McKeown, p.897, lists the camera as a "folding rollfilm camera" by "SNK Camera Works". ↑ Example pictured in this page (lens no.101611), and examples observed in online auctions. ↑ Example pictured in Onodera, pp.15–6 of Camera Collectors' News no.127, and observed in an online auction. ↑ McKeown, p.240. Daitoh made inexpensive cameras including one called Grace, a name variant of the Ponix. This is probably the source of the confusion. ↑ Furukawa, in Camera Collectors' News no.156. ↑ McKeown, p.890; Furukawa, pp.1–4 of Camera Collectors' News no.156. ↑ Examples pictured in this page, in Sugiyama, item 1404, in Furukawa, p.2 of Camera Collectors' News no.156, and observed in online auctions. ↑ Example pictured in Sugiyama, item 1404. "Kokusan shashinki no genjōchōsa" (国産写真機ノ現状調査, Inquiry into Japanese cameras), listing Japanese camera production as of April 1943. Reproduced in Supuringu kamera de ikou: Zen 69 kishu no shōkai to tsukaikata (スプリングカメラでいこう: 全69機種の紹介と使い方, Let's try spring cameras: Presentation and use of 69 machines). Tokyo: Shashinkogyo Syuppan-sha, 2004. ISBN 4-87956-072-3. Pp.180–7. Item 95. "Kokusan shashinki no kōtei kakaku" (国産写真機の公定価格, Set prices of the Japanese cameras), listing Japanese camera production as of October 25, 1940 and setting the retail prices from December 10, 1940. Published in Asahi Camera January 1941 and reproduced in Shōwa 10—40nen kōkoku ni miru kokusan kamera no rekishi (昭和10〜40年広告にみる国産カメラの歴史, Japanese camera history as seen in advertisements, 1935—1965). Tokyo: Asahi Shinbunsha, 1994. ISBN 4-02-330312-7. Pp.108—9. Type 3, section 7B; type 4, sections 3, 4, 5A, 6A. McKeown, James M. and Joan C. McKeown's Price Guide to Antique and Classic Cameras, 12th Edition, 2005-2006. USA, Centennial Photo Service, 2004. ISBN 0-931838-40-1 (hardcover). ISBN 0-931838-41-X (softcover). Pp.240, 371, 464–5, 890 and 897. Nihon Shashin Kōgyō Tsūshin (日本写真興業通信). Hyaku-gō goto jūkai no kiroku (百号ごと十回の記録, Ten records, every hundred issues). Tokyo: Nihon Shashin Kōgyō Tsūshin Sha (日本写真興業通信社), 1967. No ISBN number. Advertisement on p.77, corresponding to the third cover of the February 15, 1944 issue, and on p.85, corresponding to the third cover of the April 20, 1948 issue. Sugiyama, Kōichi (杉山浩一); Naoi, Hiroaki (直井浩明); Bullock, John R. The Collector's Guide to Japanese Cameras. 国産カメラ図鑑 (Kokusan kamera zukan). Tokyo: Asahi Sonorama, 1985. ISBN 4-257-03187-5. Item 1404.